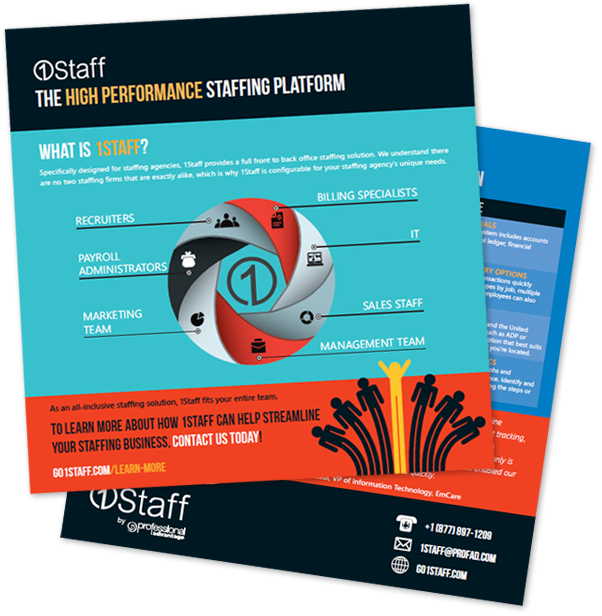 1Staff Front-to-Back Staffing Software is built in Microsoft Dynamics® CRM and Microsoft Dynamics® GP, and is designed to fit the unique needs of the staffing industry. Your System, Your Way…see how 1Staff allows Sales Staff, Recruiters, Payroll and Billing Specialists to all work on one Platform. Whether you are looking for a Front-to-Back solution with a full suite of functionality, or a robust Back Office or Front Office to integrate with your existing solution, 1Staff powered by Microsoft Dynamics has you covered.